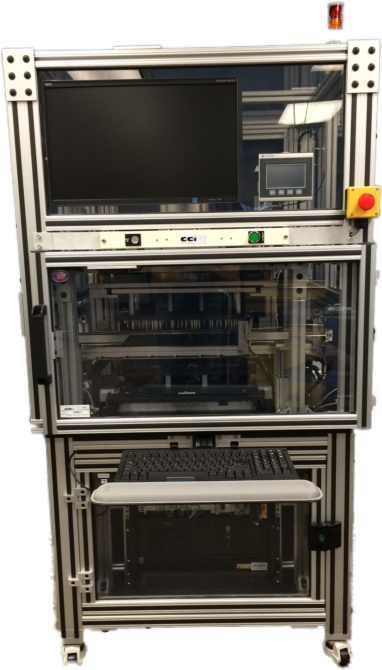 The Circuit Check 5000 Series In-line Handler is an integrated inline solution that combines automation, fixturing and measurement hardware in addition to other in-line PCBA probe based test stations, while adding a standardized quick change fixture interface. The 5000 series in-line is a unified solution that is software and hardware agnostic, enabling adaptability to a variety of off-the-shelf lower cost ICT, flash and functional test software and hardware. A key to achieving the maximum value from automated test equipment is using the same test equipment and fixture mechanics to test multiple products. Circuit Check’s 5000 Series In-line Handler achieves this by using interchangeable fixturing. Interchangeable components enable the same test system to be quickly reconfigured with new tooling for different products. This maximizes equipment re-use while minimizing the cost for each new test. The 5000 series in-line supports probes on the topside, bottom-side and multi-stage, while also being adaptable to through connector test. Configurable for in-line automated in circuit test (ICT), flash programming, and / or functional test. 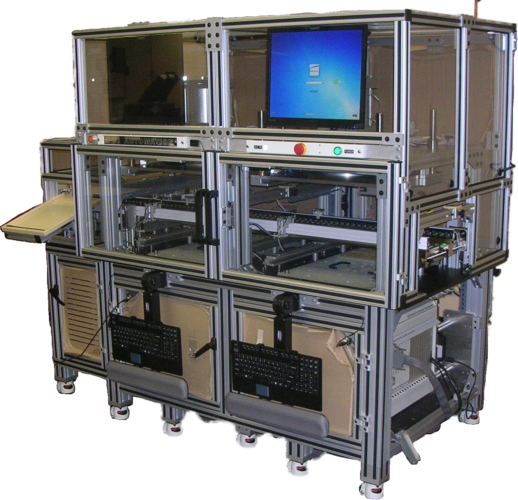 Modular & Reconfigurable Test Stations that include programming, Hipot, Vision, board level, and EOL functional test cells. The 5000 series in-line allows the manufacturer to more easily manage their test resource portfolio through a unified in-line automation system matched to customer defined test needs. The 5000 series can be configured in a single or multiple cell configuration. The 5000 series includes a dedicated industry-standard PLC executing a sequenced based conveyor control software tool. In addition, the user can control the fixturing press for both rapid and smooth press actuation, while also having control of bay specific conveyor speed to achieve an optimum production beat-rate. Circuit Check test systems are based upon modular technologies to accelerate deployment and enable capital equipment reuse. For over 40 years, Circuit Check is the partner of choice delivering thousands of systems and hundreds of thousands of fixtures worldwide. Circuit Check understands the needs for test platforms that must operate in production test environments while preserving measurement correlation to design and validation.